Okay, I’ll admit it: I’m a slob and a serial sloucher. I can’t help myself. Sitting up straight isn’t only uncomfortable, it’s boring. My inner rebel always sees me slouching, even with the best of postural intentions in mind. It turns out that there’s a growing body of evidence that says bad posture can be a pain in the back. A recent study found slouching can cause back pain. When you slouch, your pelvis rolls backwards and your lower spine flattens. This places strain on the iliolumbar ligament, stretching your L5S1 disc. The strain placed on the iliolumbar ligament can even be close to its failure point. The upshot of this is lower back pain. Similar studies also found psychological links. Extended slumping can heighten depression. Who would have thunk? As we spend more and more time slouched in front of screens, the implications of these findings are huge. The numbers of Kiwis with back problems is terrifying. In 2016, ACC received a whopping 141,093 neck, back of head vertebrae and upper back injury claims. This is a big jump on the already massive 130,771 claims made during 2014. Not all claims made were posture related, but the numbers (and associated costs) are massive. There may be light at the end of the tunnel, though. 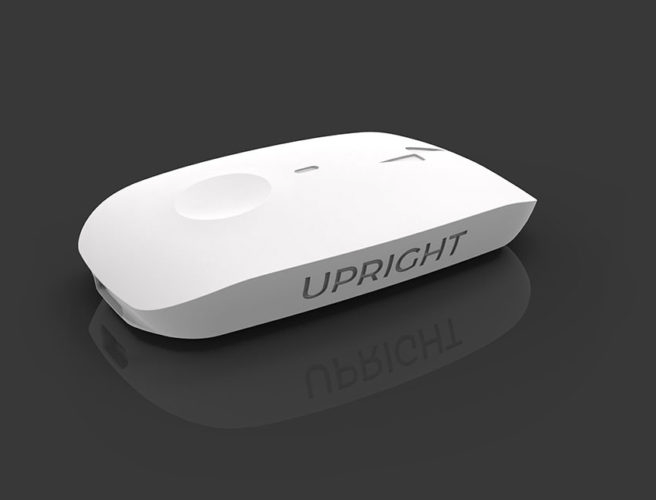 Upright Technologies have developed a widget that monitors and corrects posture. It’s called the Upright Go, it’s small and adheres onto your upper back. 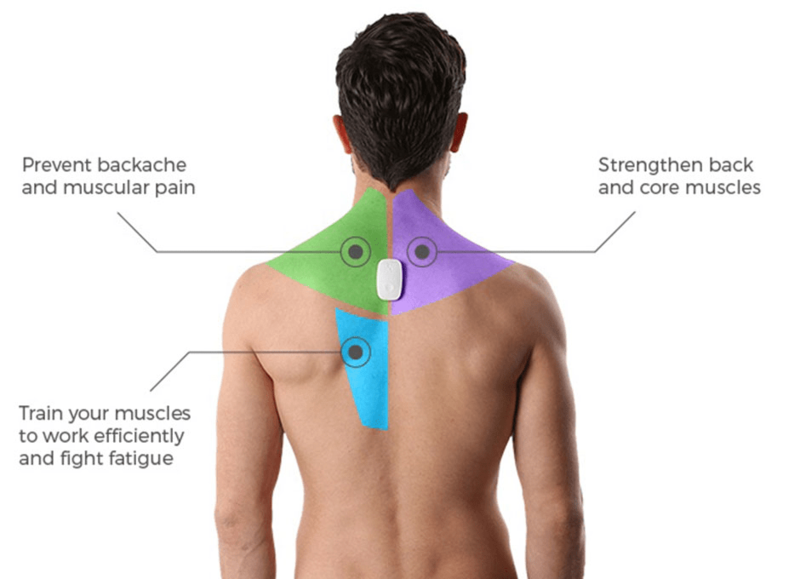 The theory goes that it’ll train you into a better posture by vibrating when it detects you’re slouching. It’s about the size of a box of matches and comes with a small travel case. Also included is a USB charging cable plus five adhesive patches. These allow the Upright Go to stick to your upper back. They last upwards of a fortnight and need to get cleaned with the bundled alcohol wipes before use. Getting set up involves downloading the Upright Go app for Android or iOS and keying in a few vital stats. 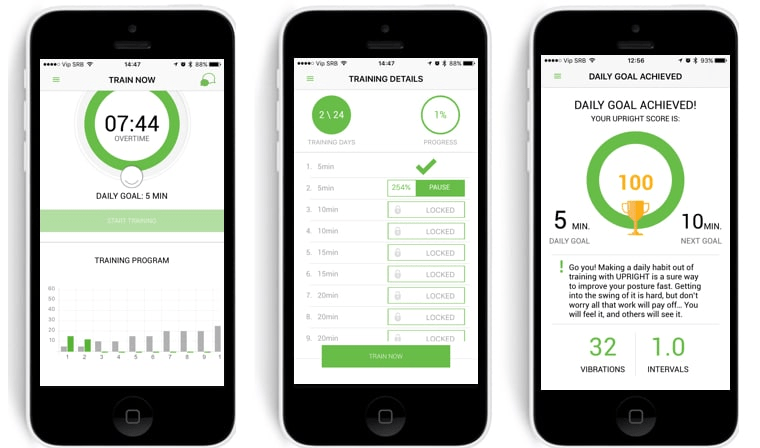 These allow the app to build a tailored training program. Training starts with a few minutes exercise each day and increases in frequency and duration. Using the app, you can switch to a tracking mode. This records posture without the Upright Go vibrating (which can be distracting). The Upright Go has a smooth, white silicone shell. Its controls consist of an LED light status indicator and on off button. Because it is so small you can attach it to your upper back without looking like the Hunchback of Notre Dame. After attaching it, the next step involves calibration. This gets done by hitting the power button twice. This is tricky as it is stuck between your shoulder blades. It can also get done using the app – which is thankfully a contortion free undertaking. Calibration happens because placement of the Upright Go varies with each application. This can affect its slouch detection capabilities. In use, I found that the double-sided patches provided enough stickiness but didn’t rip skin off my back. It’s also worth noting that with excessive sweating the Upright Go can slip off your back. I got a tad under two days use between charges. Upright Go first struck me as a solution looking for a problem. In use it had me paying closer attention to my posture. After a week’s use I found myself straightening up, aware I was about to slouch even if I wasn’t wearing the Upright Go. All told, it was easy to use and comfy to wear. Above all, it worked.